Still having trouble getting the focus & energy to sit down & do any real painting at night, so I've been continuing with other stuff. I went ahead and put together some movement trays, as I previously posted about. 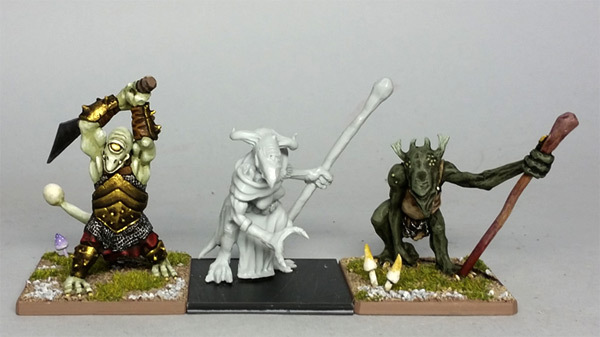 I also touched up & rebased some more Moor Hounds (Citadel dire wolves.) As with the last batch, I just repainted the red eyes, highlighted the teeth & tongue, and touched up any chipped paint. Then I put them onto new bases to fit the rest of my figures. I also received Stuff! In the Mail! "Morrighu," a resin cast of a sculpt from Ross Whitehorn of the Fimir Facebook group. I cleaned her up, took a comparison pic and primed her and... it's a bit of the dreaded "fuzzy primer." Figures it would be on a unique figure like this. I'm going to clean her up & see if I can recover from that. I don't want to strip the figure because I'm not really sure what type of resin this is, nor how various strippers might affect the material. The resin is interesting -- it's slightly soft & flexible, but nothing near Reaper's bones or other "soft plastic" figures. It cleaned up super easy with just a blade, and drilling for pinning the pieces together was also easy. Both the sculpting and the casting on this figure are great. Nice and crisp, very little cleanup. My only (minor) criticism is that I'm not fond of the way the eye appears to be sculpted. At any rate, here is a pic next to one of my converted Reaper figures, and an oldschool Citadel Fimir Dirach, for scale. Pretty good! Someday I'm going to get around to painting my own small collection of Fimir, and your work will be very influential on how I tackle them. And I also look forward to seeing more Fimir around. Behold! The Power of Veggies!